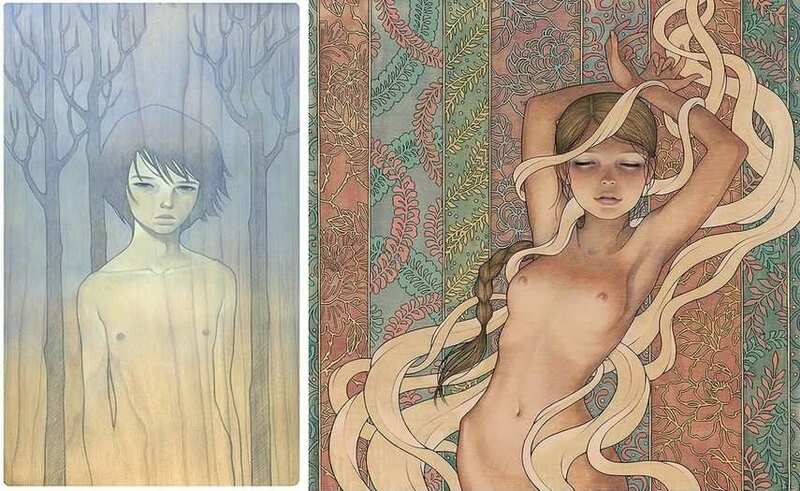 The Japanese-American artists Audrey Kawasaki is known for her erotically charged figurative paintings and the consistency of her style that merges several influences. 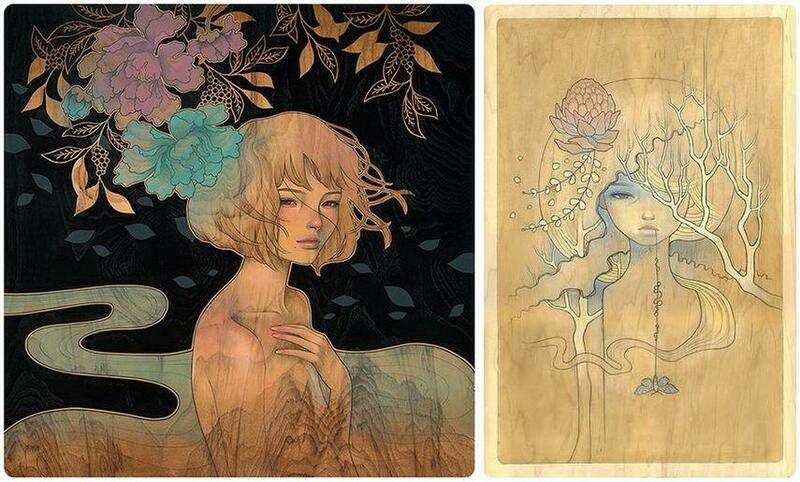 For the first time in two years, Audrey Kawasaki solo art exhibition Interlude will be presented at Thinkspace Gallery. Creating vivid narratives, she depicts a single girl in many reflections that captivate the viewer with the direct stare of their bedroom eyes. Employing contradictory elements, her works are both graphic and ethereal, innocent and dark, hopeful and morbid, controlled and ecstatic. With the new body of work, Kawasaki has turned a corner stylistically and has pushed herself to rethink the creative process and technical execution. The exhibition Interlude will feature the largest collection of new work in some time. 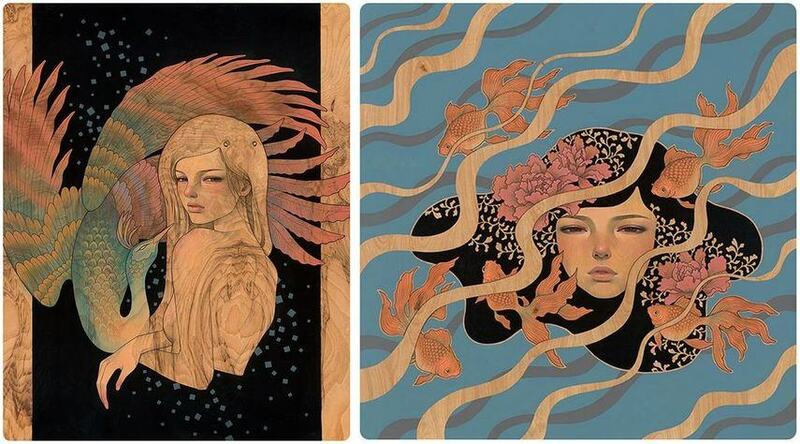 Due to her family background, the works of Audrey Kawasaki are a unique and cohesive combination of Eastern and Western aesthetics. Her highly illustrative style is inspired by manga comics and anime on one hand, and the European Art Nouveau one the other, as seen in her preference for clean line work and ornate, organic imagery. Both sad and visually appealing, her paintings depict melancholy and sensuality of contemplative young naked girls. Doe-eyed and dreamy, her subjects are both lonely and confident, sexual and vulnerable, denoting a ghost-like presence. With precocious innocence and undeniable eroticism, these characters are an expression of the artist’s freedom and a grounds for fantasy and desire, free from the reality of social constraints. 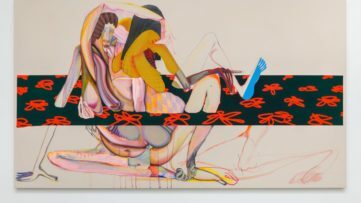 At times vulgar, and at others vulnerable, Kawasaki’s works explore the feminine expressions of sexuality in a bold way. Firmly rooted in drawing, her oil paintings are executed on smooth wood panels preferred for its organic warmth and natural inconsistencies. She begins each work with a pencil, sketching the woman’s face, torso, chest, legs, and arms. Once the drawing is complete and sealed with a gel medium, she applies multiple layers of paint directly onto the panels which allows the wood grain to show and merge with the image. Thus, the panel itself becomes an element in her compositions. With a preference for muted palettes, she is a perfectionist with a penchant for luminous and translucent skins and gradient color transitions. 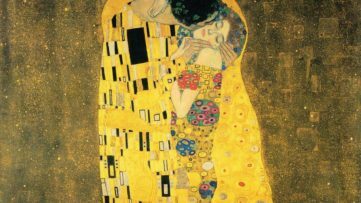 The artist’s oeuvre has been featured in numerous solo and group exhibitions at galleries around the world, in the cities such as Rome, Los Angeles, New York, Tokyo, and Melbourne. The exhibition Interlude will be on view at Thinkspace Gallery in Los Angeles from November 12th through December 3rd, 2016. 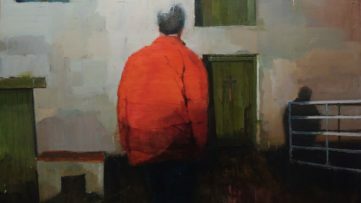 The opening reception with the artist in attendance will be held on Saturday, November 12th, from 6 to 9pm. This highly anticipated exhibition is her first with the gallery in LA since 2011. Featured image: Audrey Kawasaki – Hasami, 2008. All images courtesy of Thinkspace Gallery.